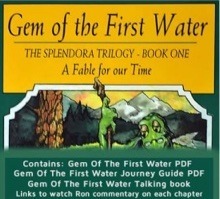 A PDF download of the first in the Gem series, “The Gem Of the First Water“. understanding the Eight Elements of Self and the acquisition of identity. The Boy’s many adventures and learning moments develop his character, his understanding of life and his ability to know himself and to cultivate quality relationships. Used in combination with the Storyteller’s guide – Gem of the First Water is transformed into a full curriculum that teaches a young person how to live in a healthy and fulfilling way having mastered their thoughts, feelings and time. Download link will be sent with your order confirmation. Please check your spam folder for the confirmation email. The second book in the Splendora Trilogy continues the development ofthe character of Plymouth the peer/hero from Gem of the First Water and takes him on further spectacular journeys. As he seeks a series of gemstones, he learns about more complex issues of human behaviour such as his relationships with siblings and parents, boy meets girl stuff and even our relationship with the natural world. such profound issues as the meaning of life, how to be a person of significance and why bad stuff happens to good people. A PDF download of the Travels Of Plymouth Journey Guide. The Travels of Plymouth is the second book in the Splendora Trilogy. This book continues the story of the peer/hero from Gem of the First Water and now takes him on further journeys where he learns about more complex issues of human behaviour such as sibling realtionships, ecology, family realtionships, social engineering and the like. This book begins the story of a kind of peer/hero character who finds himself in a fanciful land and embarks on a quest that will take him through many adventures and learning that develop his character, his understanding of life and his ability to have quality relationships. Available only as part of the forthcoming classroom kits.